If you embroider, chances are you’re familiar with stranded cotton, which is probably the most popularly used cotton embroidery floss (or thread). Next popular is likely to be perle (or pearl) cotton. These two cotton threads are widely available, so most stitchers are familiar with them. 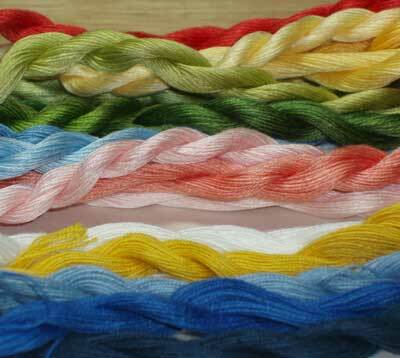 But there are other cotton embroidery threads out there! 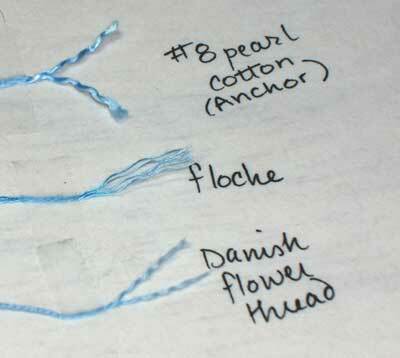 Here are two that I like – floche and Danish flower thread. I’ve talked a bit about floche before, and have already written up a comparison between floche, perle cotton, and stranded cotton. This time, I’m throwing Danish flower thread into the mix. Above, a pile of floche…. … and here’s a (smaller) pile of Danish flower thread. Right off, you can see a difference between the two threads. The Danish flower thread is in the foreground. Notice that that there’s no real sheen on it like there is on the floche. Floche is mercerized cotton, so it has a nice shine to it. Danish flower thread is matte cotton, so there’s no shine to it. There are two similar blues as far as colors go – but they look distinctly different, for two reasons. One is the sheen from the mercerization on the floche. The other is the twist of the individual thread. 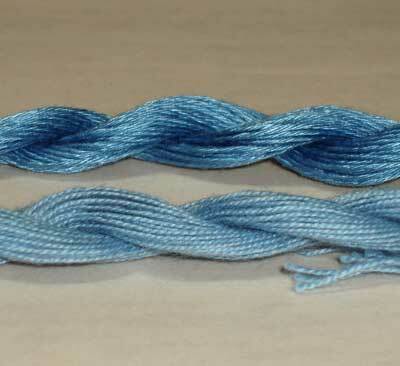 If you look at the floche, in this picture you can see that the individual threads (each ply that makes up the strand) are not too tightly twisted. 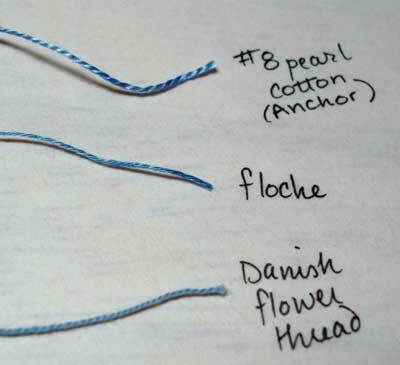 On the Danish flower thread, the plies are twisted relatively tight, compared to the plies on the floche. The twist definitely has a lot to do with the reflection of light on a thread, so it isn’t just the shine of the mercerization that makes floche and flower thread different. But twist and finish (matte vs. mercerized) aren’t the only differences in the two threads. Here, I’ve lined the two threads up next to a #8 pearl cotton. Actually, a #12 would have been closer in size – but I only have white in #12, and it didn’t show up as well. 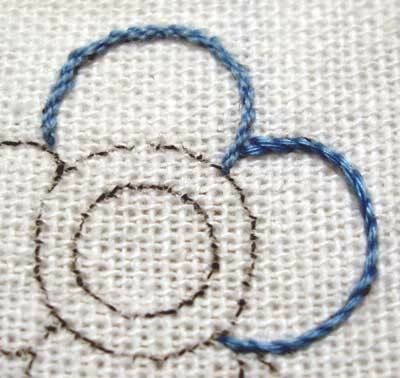 If you look at the construction of the threads, you can see that the pearl and the flower thread look alike, but the floche looks a lot smoother. This is because the pearl and the flower thread are only two plies twisted relatively tightly, while the floche is five plies, and the twists that hold the plies together are much longer than the twists on the other two threads. I’m sure there’s a technical name to the length of a twist… but… I don’t know it! I stitched two petals on a flower on a tea towel, each with a different thread. Which petal is floche, and which is flower thread? If you said the top one is the flower thread, you’re right. When you see them side-by-side, it’s really easy to tell the difference between the two threads. Besides the obvious sheen on the floche, it is a “softer” looking thread. Danish flower thread is a non-divisible thread (that means you don’t separate it into smaller threads to work with), equal to about 2 to 3 strands of regular stranded cotton. As mentioned before, it’s not mercerized, so it’s got a matte finish, which makes it look, in a sense, “dull.” To me, it almost feels like crewel wool, but with a tighter twist and not as much “fuzz.” It feels sort of dry, if that makes any sense! Flower thread has been around for a while – the original Danish thread was produced in the early 1900’s, when the thread was dyed to mimic plant dyed threads used in Scandinavian needlework. 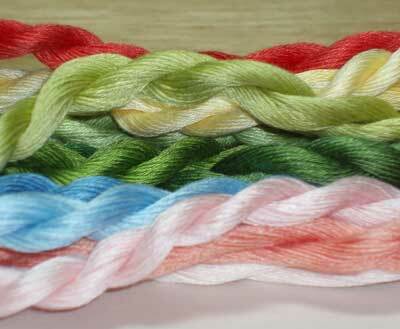 DMC eventually picked up the idea, and produces a flower thread as well, but the “original dyed” flower thread is Danish flower thread. You may wonder what Danish flower thread is used for – why would a matte finish thread be popular enough that DMC would decide to produce a line of it, for example? The matte threads are wonderful for creating the look of historical embroidery – if you want a really old look to your work (if you’re creating an historical sampler, for example), Danish flower thread is great for that. Also, the contrast you can achieve in stitching with a matte finish thread now and then adds interest to a project. Imagine if you’re stitching on a crazy quilt seam, for example, and you’re using a fabric with a high sheen to it. A matte finish thread would stand out well on it. Think Mountmellick embroidery – it’s the same concept. The contrast between the matte threads and the cotton sateen is characteristic of Mountmellick embroidery, and really very beautiful. So there’s yet another cotton thread to consider giving a try! It’s beautiful stuff, isn’t it? Can I just say, I LOVE these posts on the different types of thread. I have only ever stitched with stranded DMC floss and it’s nice to know about the other options and what they’re good for! Thanks, mub! I’m glad you like the comparisons! Once you start exploring the different types of threads available for stitching, it opens up a Whole New World of embroidery… and unfortunately, it could also be dangerous. I think I’m addicted to thread! I am an admitted fabric junkie but now add thread to my addiction. Love the lessons, Mary, and btw I answered the quiz correctly. ha ha. Thanks Mary for the the information of the threads. The floche is on the right because it has the sheen. This is great to see these comparisons! I sometimes look for embroidery thread on ebay and other than the regular 6 strand DMC I’m never sure what I’m looking at. I’ve seen the Danish flower thread and the now discontinued DMC flower thread on ebay and wondered about them. I was going to bid on an auction for the DMC flower thread but it turned out that lots of folks were bidding and the price went quite high, so I left it alone. I did end up getting a batch of Anchor #5 pearl, and tho’ I loved the colors in the batch, I didn’t know what #5 guage (or any other guage for that matter) would be like, and it turned out it was a good bit heavier than I’d hoped. Actually the various guages of thread, as compared to the only thread I really know, 6 strand DMC, is what has me most confused. The same could be said of the thickness of various types of thread, floche compared to coton a broder compared to 6 strand DMC for instance. What would the most helpful thing ever for me, in trying to understand what these various threads may look like size wise, is if they could be compared to 6 strand DMC as the standard. Know what I mean, jelly bean?…Like if you could say a strand of floche is equal to X number of strands of DMC. Coton a broder is equal to this number of strands. #8 gauge =’s this. #12 =’s this number of strands, etc. I think if I had a better understanding of the sizes of threads I could get rid of the fright of ordering online. 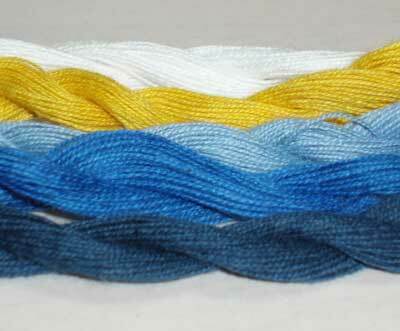 I don’t want to get another big batch of threads that aren’t really what I want to use, like the #5 pearl. Thank you so much for this show ‘n tell explaination on these threads, Mary! It really does help a lot! And I’m sorry to press on your time with my confusion regarding various threads but I figured it couldn’t hurt to tell you what has me baffled. I thought maybe somewhere down the line, you know, like if you trip over a big pile of spare time or something, you might be able to do some sort of size comparison dealie. Yum! That pile of floche is so delicious looking! I also would like to thank you for these thread comparisons, Mary, they are very helpful and interesting. Thankyou for that comprehensive description of floche and flower thread. I tend to use mainly cotton and then mainly floss and perle but will need to track down some of the above. I quite like the little coton a broder I inherited – it stitches nicely. Thanks again for a wonderful blog – I missed reading it for a while – too busy – and now I am back I have catching up to do! Many congratulations for the excellent site ! I am a newcomer to your site and saw many of your works in the Archives. Very beautiful work. Specially liked the “Asleep-Awake” pillowcases in November 07 posts as my next project is pillowcases. 🙂 Would you be able to provide me with the pattern for those lovely faces? Actually, I don’t have a pattern for those. I took a bottle cap from a vitamin bottle and drew the circles, overlapping them and setting some forward and some back, then I just free-handed the faces with whatever came to mind! Maybe I should work up a pattern for those one of these days, since several people have asked. In the meantime, though – try your hand at it. You might find it’s kind of fun to make up silly faces! Margb – welcome back! I know life gets extra ordinarily busy now and then. But I’m glad you checked back in! I’m glad you all like the thread comparisons… Jeannine, I compared the floche to DMC in the earlier post – I suppose I should have thrown it into the mix here. But you should get a good idea of it. I also mentioned that the flower thread is equal to 2 or 3 strands of stranded cotton… but that doesn’t make much sense, I suppose, as there’s quite a difference between 2 and 3 strands (well, at least one-third)… so I’d put it closer to 2 strands! Susan. Yes. It’s seems we have similar addictions! But hey, in the world we live in, it’s not THAT bad of an addiction, relatively speaking! Hi Mary, thank you so much for the comparision between the 2 types of thread. Without buying each thread, I could not hope to make a good decision on which to use for any projects. I would like to do a project that requires #5, #8 and #12 pearl cotton. I would like to do this in Anchor 301, but I don’t think I can get #12 in this colour. Any advice would be appreciated. Wow! This was a great post for me…highly informative. After a lifetime of needlework I am about to try flower thread for the first time and I really appreciate the rundown. The comparison idea is a very good way to see the difference. I also had never before clicked onto the reason why I didn’t like my past Mountmellick work as well as some I had seen. The matte verses sheen explained that for me. I also appreciate the tip on where to buy. I had been googling places before seeing this post and was slightly confused as to where to go. Thanks for a great site. I’ll definitely be checking back now that I’ve found it. I am a complete new comer to embroidery, and I have found your site to be something I now refer to at every turn, the tips, tutorials and visual aids have been such a help to me, it has allowed me to feel that I can tackle almost any project, but most importantly it has allowed me to create some wonderful personalised gifts for my daughter that she will now have for life, thank you so much, I now have a wonderful hobby that will never get old!!!! I’ve got a problem Mary, I just bought a cross stitch pattern from 1996 using DMC Flower Thread on 32 ct. linen. DMC doesn’t produce Flower Thread any longer, and since the numbers are in the two thousand range I don’t have a chance at a reasonable substitute. The pattern is by Curtis Boehringer of A Christmas Carol using 10 colors, with no color picture to guess the colors. I’ve Googled like crazy trying to find a picture, but no luck. Is there anything you can suggest as to what kind of thread I can substitute as far as thickness and/or look? I guess I’ll just have to guess at the rest. Hi, Laurie – I think coton a broder #25 might be a little too heavy for 32 count, but you might try it. I’ve not used DMC’s flower thread, so I’m not exactly sure of its construction. Danish flower thread, though, is similar in construction. I’m not sure how to tackle the color problem, though, unless you can find someone out there somewhere who has an old color card from that era. I find your blog so helpful. Thank you very much for this comparison, I’ve found it really interesting and so informative. Love this comparison. I live in Scandinavia and have flower thread in my local embroidery store. I’m thinking I need to get hold of some floche, especially since I want to learn better satin stiches! Previous Previous post: Breath of Spring – a Surface Embroider Sampler of Sorts? Next Next post: Reader’s Embroidery: Saxon and Norman? ?